I have lived some of my life as a prodigal child. I know that there are always seasons where our life with God becomes stagnant, but there have been times I’ve turned my back on Him, and had to come to a point of repentance and restoration. Recently, I was reflecting on how it changed my heart; having lived on “that side of the fence” and making poor choices that affected my relationship with my Heavenly Father. I was surprised by a few things while reading in Luke 15, that I had not applied before. I believe that the father never stopped loving his son, and thought of him every single day, but he held himself back and allowed him to live his life. Only then was the son able to realize how much better off the servants were in his father’s house; and it was THEN that he was able to be changed, capable of taking on the task of returning home with a servant’s heart. The son could have hid his misfortune, and arrogantly attempted to blow off any sense of failure. I’m sure that the smell of working with the hogs would have preceded him, but often we do try to pretend that we have had a great journey despite the real outcome. Yet here we get to see repentance and restoration, the way it’s supposed to happen. 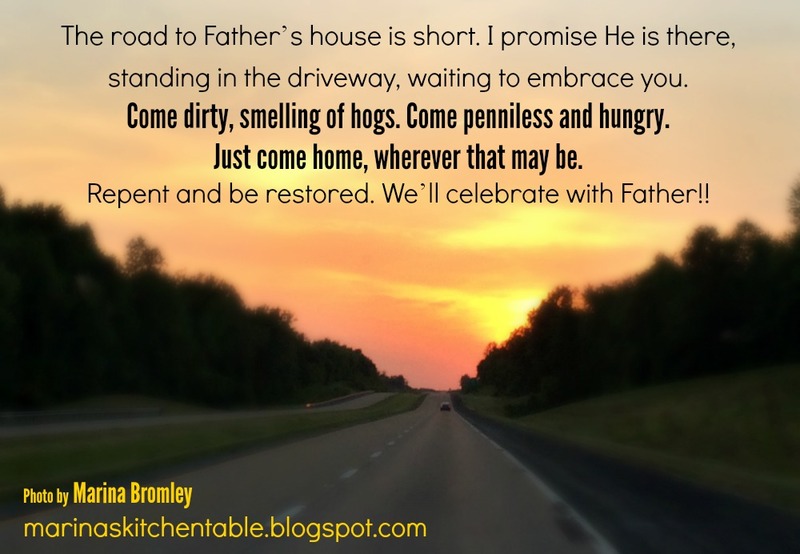 So why is it that many of us who want to return “home to our Father” are held back? Is it that many of us feel that we need to clean up our act before returning home? We want to give up this habit, or that addiction. We want to make that move to make us look a little cleaner on the outside, create some illusion that our life away from Dad wasn’t all that bad. If the prodigal son did any cleaning up, it wasn’t mentioned in the story. The road to Father’s house is short. I promise He is there, standing in the driveway, waiting to embrace you. Come dirty, smelling of hogs. Come penniless and hungry. Just come home, wherever that may be. Repent and be restored. We’ll celebrate with Father!! This article appeared as the "Inspiration" for the Connection Magazine of Southwest Missouri in January of 2010. You can read the original post here (the original magazine format was not yet online).